Hand-foot-and-mouth disease gets its name from its symptoms, including mouth sores and a rash on the hands and feet. When I first heard about hand-foot-and-mouth disease it sounded to me like some antiquated illness eradicated long ago. But I have since learned that this virus, which mainly affects children, is still prevalent in 2018 with several states currently reporting a rise in diagnoses. And it is currently going around the Philadelphia area. Hand-foot-and-mouth disease is a viral infection most commonly contracted by children under five years old but all ages can get it. The disease gets its name from its symptoms, including mouth sores and a rash on the hands and feet. This illness is highly contagious through person-to-person contact and late summer and early fall are peak periods for outbreaks. A friend of mine in Blue Bell knows two families whose toddlers are currently battling or recovering from hand-foot-and-mouth. Another friend who lives in Manhattan recently found out that her toddler was exposed to someone with hand-foot-and-mouth. Thankfully her daughter did not catch it but had to be kept away from her newborn brother for a couple of weeks just to play it safe since fevers can be really dangerous for infants. Doctors in Indiana, South Carolina, Tennessee and Virginia are reporting an increase in hand-foot-and-mouth cases this summer. And two Major League Baseball players in New York have been diagnosed. Hand-foot-and-mouth disease is spread through kissing, hugging, sharing food and drinks, and being exposed to coughing, sneezing and dirty diapers of those who already have the illness. It can move through daycare centers and schools like wildfire. With summer camps still in swing and the start of the school year fast approaching I think we parents need to be diligent about our children’s hygiene and know what to look for. According to Children’s Hospital of Philadelphia, symptoms include blister-like bumps inside the mouth usually near the back of the throat, small blisters on hands, feet and diaper area, a rash on the arms and legs and a fever. Symptoms can occur several days after exposure and sometimes people contract the illness without presenting any symptoms at all. Anyone who has open sores and/or a fever should be kept home. Even after the patient recovers, they can still usually transmit the disease for up to three weeks. Handwashing is one of the most important ways to stop the spread of hand-foot-and-mouth disease. The good news is that hand-foot-and-mouth disease is usually more annoying than serious. The illness lasts for 7-10 days. Patients are commonly told to drink water frequently, as dehydration is a serious side effect, and rest until they are through it. Acetaminophen or ibuprofen can be used for pain management as the blisters and rash can be uncomfortable. But in rare cases, hand-foot-and-mouth disease has led to serious complications like viral meningitis or a polio-like paralysis so it is not something to be taken lightly. How can you prevent the spread of hand-foot-and-mouth disease – and many other viruses? Wash your hands and make sure your kids are, too. Handwashing is one of the most important ways to stop the spread of illness. The reason that children are more susceptible to hand-foot-and-mouth is because their personal hygiene is usually not that great. Make sure you are keeping your home clean by disinfecting commonly-used surfaces like kitchen counters and bathrooms plus your kids’ toys. If you think your child has hand-foot-and-mouth disease or notice any symptoms that are unusual contact your pediatrician to make an appointment right away. Only a doctor can provide a proper diagnosis. 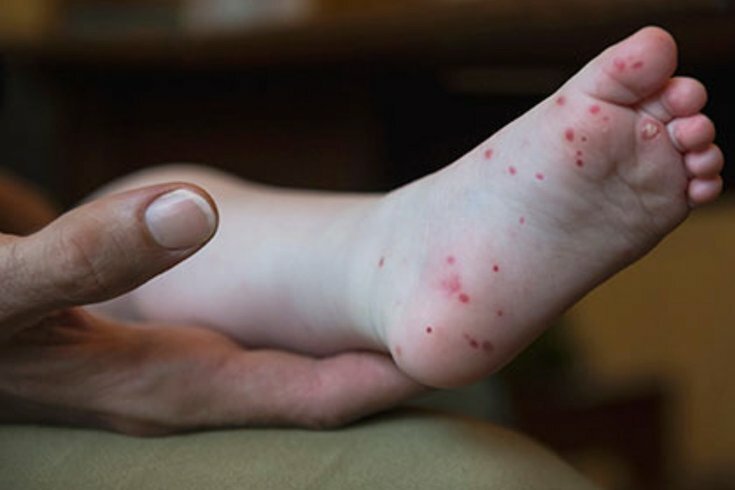 Do you know anyone currently affected by hand-foot-and-mouth disease?Share with me and other parents in the comments section or Tweet me @ThePhillyVoice and @KathleenEGagnon.